Those were the words 62-year-old Dinah Burns shouted out as she drew her concealed firearm on two goons — one armed with a baseball bat. It all began one Monday evening. Dinah was walking her dog Gracie on a trail near the local elementary school in Lancaster, Ohio, as she had done for over 26 years. Fortunately, Dinah didn’t depend on her dog to protect her from these attackers. She had just recently obtained her concealed carry permit. And that evening, she was packing! While distracting the two men with conversation, Dinah slipped her hand into her pocket, drew her firearm and switched off the safety. The man with the bat didn’t think she had the guts to pull the trigger and started to approach her. As Dinah uttered her final warning to these criminals, they suddenly realized she was serious and ran off. This attempted abduction ended well for Dinah — but there are three concealed carry tips you MUST take away from her scary attack. While Dinah made all the right moves and escaped with her life, she’s more the exception than the rule… even among so-called “experienced” gun owners! Be honest… have you ever said any one of these statements to yourself in the past? I’ll admit that I have. But where do you think Dinah would be right now if she had left her home that fateful evening without her firearm? Stuffed in the bushes somewhere? Raped… beaten… bleeding… dying… with no help on the way? Here are three lessons from Dinah’s experience I hope YOU will consider before you ever leave your house without your weapon again. If you own a weapon, get your carry license. 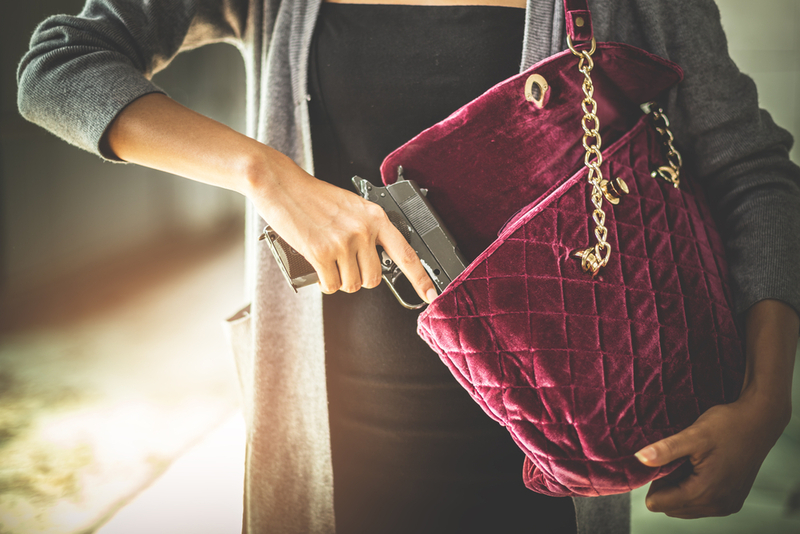 If you have a concealed carry license… carry it! People naturally let their guard down in areas that are familiar to them. After all… it’s been “safe” for the last 10 years… why would tonight be any different? Dinah was in a familiar place just walking her dog as she had done for over 26 years without a single incident. All it took was one night out of 26 years that could have traumatized her forever — or taken her life in an instant. In this story, the two men weren’t afraid of a fight from a woman. These men took Dinah, older, physically weaker and outnumbered, to be an easy target — which gave her plenty of time to get to her gun. If you’re a guy, you most likely aren’t going to get ANY accommodation. Criminals aren’t looking for a fight — which is why they travel in pairs (or packs) and will come out of nowhere to ambush you with no warning. When that happens, you’d damn well better be trained and ready. Unfortunately, most of what’s out there regarding gunfighting tactics aren’t based on real-world, life-or-death scenarios. That’s why we analyzed over 200 real-life gunfights and created a free report on the cold, hard truth about what it REALLY takes to stop a violent attacker with your gun. If you’re not following these principles, you’re setting yourself up for a potentially traumatic wake-up call… that could cost you your life.